The Mirage pond aerator for ponds and lakes generate bubbles and ripple on pond surfaces, circulate and improve the quality of your pond water. The Mirage pond aerator for ponds and lakes generate bubbles and ripple on pond surfaces and improve the quality of your pond water. 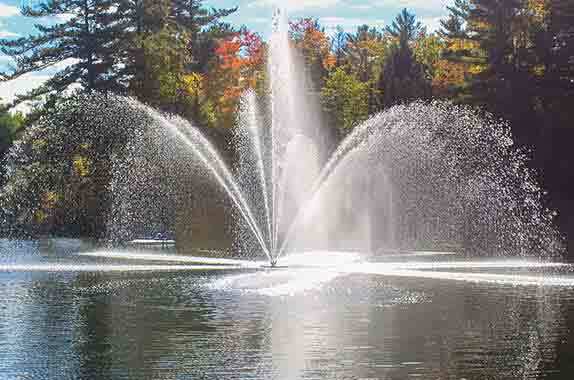 The Arbrux Mirage pond aerator for ponds and lakes spray pattern is a low profile pattern. With a 1 HP motor the aerators spray height is 3 feet and the width is approximately 4 feet. All pond aerators are built with quality components. They are virtually maintenance free and built to last. Have your electrician connect power to motor controls.